Discover the differences in water softener technology and benefits. 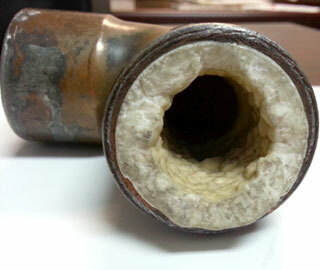 The benefits water softeners provide are numerous and well known, especially those in areas affected by hard water. Having soft water in your home can help you save money on energy, as well as on many household cleaning products. A modern efficient system can also help the environment by using less water and salt in order to do the same job as traditionally designed softeners, not all water softeners are the same. According to the Battelle Memorial Institute for the Water Quality Association study almost 30lbs of calcium can build up layers in your water heater reducing its efficiency by almost 50% per 1/8th inch layer. Also, calcium buildup in your pipes can reduce water flow in your home shower heads, faucets and appliances shortening their service life by years. San Antonio municipal water is 18 grains per gallon of hardness; this is equal to over 300lbs of rock annually. Over time this can create many headaches and significant costs to the homeowner. Water softening technology has been around a long time, over 50 years in fact. Most softeners of a conventional design use more water and salt than is needed compared to high efficiency designed softeners such as the Hague Water-max for example. Conventional systems will use up to 120 gallons of water and up to 15lbs of salt to clean themselves each time. A high efficiency softener such as the Water-max uses as little as 16 gallons of water and 3lbs to 5lbs in order to clean itself each time. As you can see high efficiency softeners are up to 70% more efficient and are much better for the environment as well as your wallet. Using soft water around the house also has many benefits and savings with the cleaning products you use and purchase. When using soft water you can reduce the amount of soap used for laundry and showers by 70%. The calcium stains on all the fixtures and shower doors are a thing of the past so you will save money not having to purchase toxic chemicals just to see out of the shower door. Reducing the amount of soap used and eliminating the purchase of harsh chemicals saves homeowners hundreds of dollars annually. A person’s home is usually the biggest single investment they make and it is where families spend large portions of their lives. Having soft water in your home is something that can save hundreds of dollars in energy costs, soaps, cleaning products and appliance replacement due to significantly shortened service resulting from hard water. Investing in a high efficiency water softener will reduce salt and water usage by up to 70% aiding in the conservation of water and money both of which are very important to us all.